So you love the look and feel of a professional clean and detail on your vehicle, but you don’t like the price. The truth is, all you need to have is the time and a few tools to get the job done by yourself. It is easier to get a professional detail at-home today than it ever has been before. Just stop by your local Fall River, MA car parts store at LaCava Brothers and you can get all of the products and tools needed to make your car truly shine. In addition to products from your auto parts store, it is also important to pick up a few techniques that will help you maximize the results. Newer vehicles are now painted with a high-tech paint that is more durable and holds its shine for much longer than the products originally used on older vehicles. Back in the day, detailing your car would have meant spending hours and hours using rubbing compound, newspaper, and a chamois. Today, you can achieve the same lustrous look with paint-cleaning clay, microfiber, and chemical paint cleaners. However, it is important to note that you can’t just go down to your local auto supply in Fall River, grab some chemicals and a rotating buffer, and think you are going to get showroom results. In fact, if you don’t know what you are doing, you could cause a lot of damage. It is best to go slow, ask questions, watch online videos, and learn techniques that can help you to learn how to do it the right way. If you have scratches that go all the way down the metal, you will still need to take it to a professional. While major advancements have been made in today’s products, you still need to know when to seek the help of a pro. When it comes to detailing your vehicle at home, the best place to start is on the inside. Check out everything in the interior, the handles, the rugs, the carpet, the dash, the floor mats, and everything else. While many things can be majorly improved with a good cleaning, either by vacuuming at the local car wash or by bringing out the hand vac to your own driveway, you will still want to get some nice aloe leather protectant and restoration products when you visit LaCava Brothers. Once everything is clean, you need to protect it from sun damage in the future, so it pays to be prepared. Do you know why a new car smells the way that it does? It’s because it hasn’t had months or years of abuse and sub-par cleaning. The musty smells that a car can develop come from the vent system. Changing out your cabin air filter should be done twice each year or more frequently, depending on your manufacturer’s recommendations. If you aren’t sure what size you need, stop by our Fall River, MA car parts store and one of our team members will help you find it. Your auto manual should show you where to find and how to change out the filter. If not, search online for videos that specific the year, make, and model of your vehicle. The next thing you need to do is to really clean out the HVAC ductwork in your vehicle. Compressed air is a great tool for cleaning, both inside and out. You can use an air compressor to clean out all of the dirt and dust from the ductwork, as well as blow out any extra dirt around the area of the cabin air filter when you change it. Don’t resort to using aerosol sprays or dangle a little pine tree from your mirror. Take time to properly clean your vehicle and use the right products from LaCava Brothers Auto Supply in Fall River to find the proper cabin air filter for your car or truck. A quick trip through the local car wash is okay every now and then to remove dust and debris from inclement weather or a long trip on the highway, but hand washing is best. It should be something that you enjoy doing as part of taking care of your car. When you hand wash your vehicle, it gives you the opportunity to closely inspect each and every part of it for damage, scratches, or scrapes. Make sure to use the right products for washing your car and don’t EVER use dish soap! While a large majority of Americans just fill a bucket with dish soap, this is a huge mistake. Dish soap strips your car of any protective coatings, leaving it exposed to further damage. A proper car wash solution from a trusted brand is always best. 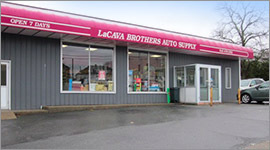 Visit LaCava Brothers Auto Supply in Fall River to view our entire line of carwash tools and products or give us a call at 508-676-1951. We carry a wide range of products at our popular auto parts store located at 1262 Bedford Street. Our team can help you find the exact products and tools you require to help make your vehicle look it’s very best.